The Statehouse grounds are undermined with tunnels. 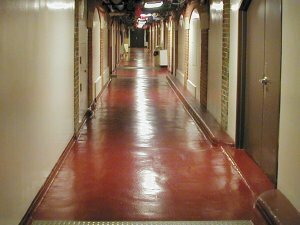 Anyone who has visited the capitol complex knows about the tunnels from the Capitol basement to the Howlett and Stratton buildings. However, what you may not know is that there are a number of underground burrows throughout the complex. In fact, it is possible to walk from the Archives Building all the way to North Klein Street which is located approximately 1 mile north of the Statehouse without ever going outside. SW tunnel to Stratton Bldg. The Armory, the Supreme Court, the Museum, the old Records Building, and the Howlett buildings are all interconnected with tunnels. Open to the public are walkways from the Howlett Building to the Archives, Howlett building to the Statehouse and Statehouse to the Stratton Office Building. 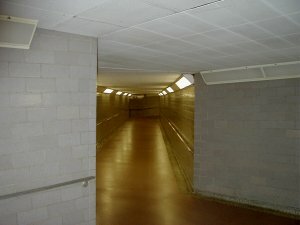 Most of the tunnels are used as utility subways and not pedestrian walkways. According to newspaper accounts, these underground hideaways were once used for storage as well. Items at one time stored in these tunnels include barrels of water and emergency rations for civil defense or attack. 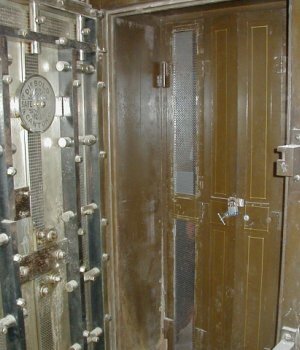 Vaults can be found in several areas of the Capitol. 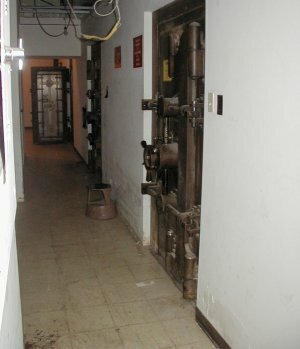 According to a January 1962 article in the Illinois State Register, these basement vaults contained as much as one billion dollars in stocks, bonds, and securities. At that time the Illinois treasury was said to be the third largest bank in the nation, ranking behind Fort Knox and the Chase Bank of New York. These vaults were secured by armed guards around the clock. Now they are used for storage of less valuable items.